Morden has fallen to the Witches, but their banes continue to prey off the mortal survivors. This book of adventures presents a variety of different challenges for Morden's Witchmarked heroes to overcome. New foes introduced and locations are expanded. The adventures range in scope, with some suited to a single evening's entertainment, while others could encompass several nights of play. Any of them can be interspersed with the Plot Point Campaign included in the Accursed core book. 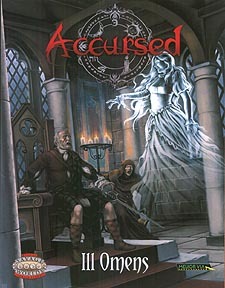 Accursed: Ill Omens includes works by an all-star cast of gaming writers. Shane Hensley, Rich Baker, Sean Patrick Fannon, and Colin McComb - among others - all contributed to this compilation. Please note: Accursed Ill Omens is not a complete game. It requires the Accursed setting book, Savage Worlds Rulebook, and the Savage Worlds Horror Companion for play.